Parks Canada and its partners, Environment and Climate Change Canada (ECCC) and the U.S. Fish and Wildlife Service (USFWS), are celebrating 50 years of whooping crane conservation at Wood Buffalo National Park. This international conservation partnership began in 1966 when the fragile state of the world’s last whooping crane flock brought Canadian and American partners together to share their knowledge and work on joint species recovery efforts. This example of successful international stewardship is a model for cooperation amongst conservation groups in the preservation of endangered species that cross international borders. Friends of the Wild Whoopers (FOTWW) is one of several private groups that supports Wood Buffalo National Park and their efforts to protect and manage the only wild Whooping Crane flock on planet Earth. FOTWW joins with Wood Buffalo personnel, the U.S. Fish and Wildlife Service and others in celebrating the 50th Anniversary of outstanding Whooping Crane conservation. One highlight of the celebration is the hatching and survival of twin Whooping Crane chicks (Figure 1). 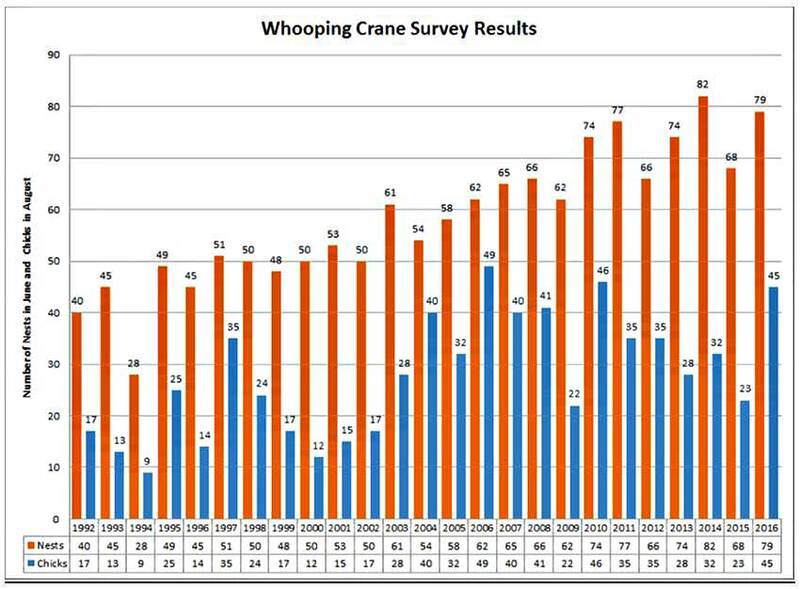 The accomplishments of Whooping Crane conservation are remarkable. Mike Keizer, External Relations Manager, Wood Buffalo explained that, “We have watched the Wood Buffalo-Aransas Whooping Crane flock grow from 48 birds in 1966 to 329 today. In fact, there are almost as many chicks born this year as there were cranes in existence when this partnership began and when annual surveys began in 1966. The 2016 chick count in August 2016 found that 45 chicks were born in 2016. 43 Whooping Crane pairs had one juvenile each and one pair had two juveniles. Annual productivity was 0.57 juveniles per nest, well above than the 20-year average of 0.48 but within the long-term natural range of variation (Figure 2). Figure 2. This chart depicts the number of Whooping Crane nest and chicks hatched on Wood Buffalo National Park, Canada from 1992 through 2016. Note that there were 40 nest in 1992 where 17 chicks hatched and survived. Likewise there were 79 nest in 2016 with 45 chicks hatching and surviving. Parks Canada manages one of the finest and most extensive systems of protected natural and cultural heritage areas in the world, and is a recognized world leader in conservation. Today, the International Whooping Crane Recovery Team oversees the cranes’ recovery. This group, made up of national, provincial, territorial, and state wildlife authorities and non-government organizations, works to preserve the ecological integrity of crane habitat, identify potential threats to the cranes, and foster research that builds a greater understanding of the species. It is noteworthy that this year, 2016, marks the 50th anniversary of an international conservation partnership intended to save Whooping Cranes – North America’s tallest bird species. They nest and fledge in Canada’s Wood Buffalo National Park in the spring and winter in the Aransas National Wildlife Refuge in Texas. They travel 2,500 miles (5,500 kilometers) two times each year between their summer and winter habitats. Parks Canada is taking this occasion to highlight what their conservation efforts have accomplished. Friends of the Wild Whoopers has examined their achievements and they are indeed impressive and continuing to show progress. 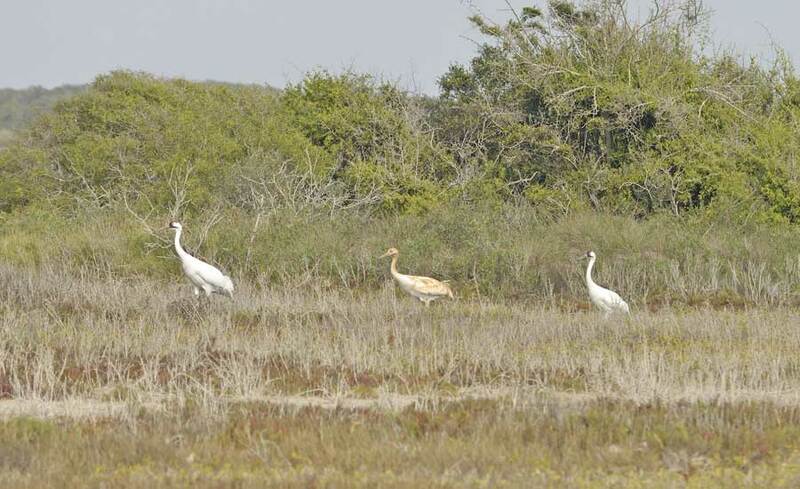 Mike Keizer, External Relations Manager, Wood Buffalo explained that, “We have watched the Wood Buffalo-Aransas Whooping Crane flock grow from 48 birds in 1966 to 329 today. In fact, there are almost as many chicks born this year as there were cranes in existence when this partnership began and when annual surveys began in 1966. The 2016 chick count in August 2016 found that 45 chicks were born in 2016. 43 Whooping Crane pairs had one juvenile each and one pair had two juveniles. Annual productivity was 0.57 juveniles per nest, well above than the 20-year average of 0.48 but within the long-term natural range of variation. “This example of successful international stewardship is a model for cooperation amongst conservation groups in the preservation of endangered species that cross international borders” emphasized Friends of the Wild Whoopers President Chester McConnell. Canada has a network of protected areas, managed by Parks Canada, that play an important role to mitigate the impacts of climate change by protecting and restoring healthy, resilient ecosystems and contributing to the recovery of species at risk. Wood Buffalo National Park is one of those protected areas. It is Canada’s largest national park with 11,070,000 acres and supports numerous wildlife species. 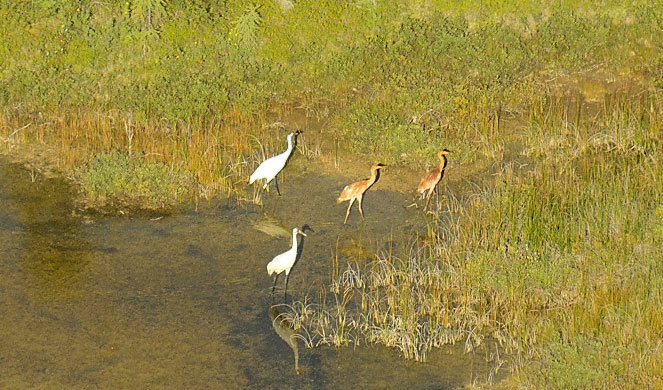 Whooping crane family at Aransas National WIldlife Refuge. Photo courtesy of Kevin Sims. Mining and oil and gas extraction account for nearly a third of threats to UNESCO World Heritage Sites in Canada over the last 30 years, according to the international organization. A total of 75 threats against nine designated natural and cultural sites have been documented by the United Nations Educational, Scientific and Cultural Organization’s State of Conservation database since 1985. Of those, 23 belong to a category called “physical resource extraction,” which consists of mining and oil and gas operations. The next most common threat types are management and institutional factors (13), service infrastructure (10), transportation infrastructure (8) and buildings and development (7). Most of the threats occurred between 2000 and 2013. 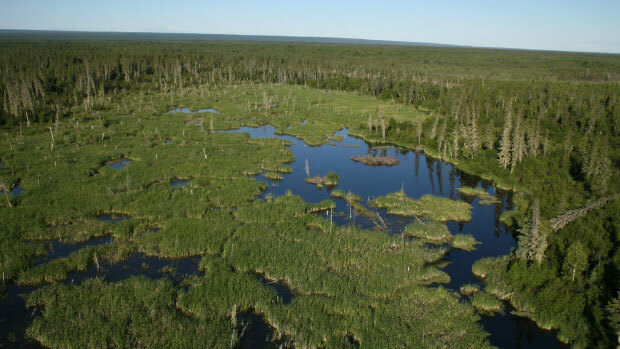 Wood Buffalo National Park in northern Alberta was the subject of the greatest number those reports, with nine in total, followed by the Historic District of Old Québec and Canadian Rocky Mountain Parks, which each had eight.